It was the final meeting of the Boeing Outdoor Adventure Club, the 2016 Holiday Party. My membership in this organization stretches back almost 30 years, back to when it was the McDonnell Douglas Backpacking Club. So many memories, so many adventures. It’s the friendships, touched with nostalgia, which caused me to brave the rush hour commute on a weeknight during the busy Christmas season; although, more and more, it seems as if every season is ‘busy’. Thankfully the holidays, when we put set aside crass capitalism, are a period where we push ‘busy’ aside, if just a bit, and focus on family and friends. Looking around the room, there are people I haven’t seen since the previous party. How did a year go by that I didn’t find time to get together with many of them until tonight. Traveling a hundred days of year for my job didn’t help, but that’s just an excuse for laziness and a lack of planning on my part. There were a few old timers in attendance who haven’t been around for years, coaxed to attend by the knowledge that this would be their last chance. One of them was Bob. The better part of a decade older than me, Bob is retired, but still active. We chatted each other up and he suggested we go hiking some time. That sounded fun, and with my own retirement looming on the horizon, we traded email addresses. Several months flashed by. An email from Bob arrives asking if I would like to go hiking? Sadly I’m leaving on a couple of road trips and will be gone for most of the next two months, but promise to contact him when I get back. I was determined not to miss this chance to share the trail with an old friend. Fast forward to last week. Bob and I scheduled around a few conflicts, agreed on a destination, and compromised on the start time (he’s not a morning person, I like to be on the trail early.) I pick Bob up and we head up into the mountains. The past few days had been brutally hot by local standards. Temperatures broke a hundred at the beach! When in doubt go higher. It was actually a little cool when we started up Icehouse Canyon, perfect weather for hiking. A summer in the mountains had left us in good condition and we easily made our way up both of ours favorite trail in the San Grabiel Mountains, arriving at Icehouse Saddle in less than two hours. The air was clear (no signs of smoke from the Wilson fire) and while it felt like August down below, it was fall here. Another mile and we enjoyed a well deserved snack on top of Timber Mountain. We had beat the heat (it was 65 degrees on top), missed the throng of weekend hikers, renewed our friendship, and are already planning new adventures. 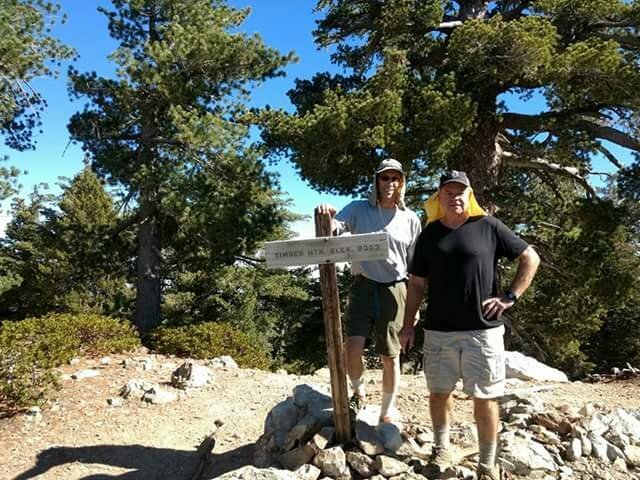 Even though we hadn’t been on the trail together for a dozen or more years, it didn’t seem like it once we started hiking. Friendships borne in the mountains are like that. Long periods of time may go by, but you feel at ease with the other person; the bond of friendship, especially among those with who you have shared a rope, is still strong. Life is busy, hectic, frantic. It can be difficult to stay as close and connected to people as we may want. Don’t let that stop you from trying. It may be years before there is a chance to again share an adventure, but when the opportunity occurs, sieze it. You’ll be glad you did.